I love this time of year. 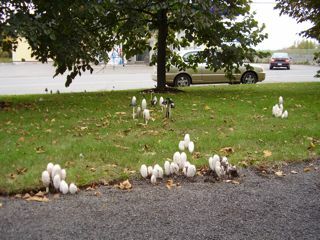 You're out for a walk, and suddenly you spot some white dots on the lawns and you know the wild mushrooms have arrived. "Do you have a death wish? ", asked a friend the other day when I wrote in Facebook that I had eaten some wild mushrooms that I had picked that day. She needn't worry: when I first moved here I asked around but nobody seemed to be eating the wild fungus so I did some research, bought a mushroom guide, and now I only pick varieties that I know are edible. The mushrooms I pick are not the kind that grow in woods. Heaven knows we have plenty of forests around here, but they're rather impenetrable. I saw some chanterelles in a park in Fredericton once. 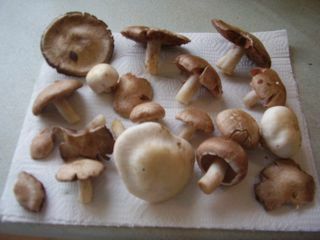 This is that day's crop, an assortment of white lawn mushrooms at various stages of maturity. As you can see, they are very close in appearance to the store-bought kind. My favourites are the bumpy ones; they are known as horse mushrooms. They are firmer and they can get as big as a dinner plate! I ate them all, sprinkled over some fresh yellow beans. The main difference between these mushrooms and the cultivated kind is their water content. These edible delicacies appear after a good rain, and they're all pumped up with water. That makes it difficult to fry them, but to me that's the best way to bring out their flavor and I don't mind stirring while the extra liquid evaporates -- the aroma is worth the trouble! I like to cook all my wild mushrooms the day I pick them, and keep them in the fridge, to be added to stews, sauces, soups, vegetables, and so on. Preparation: Unless you cut them instead of pulling them, there's going to be a lot of dirt so the first thing I do is spread them out and cut off all the dirty ends. Then I wash them in a large quantity of water. Of course they absorb more water that way but it's essential to give them a good washing -- the condition of the water afterwards confirms this. Besides, who knows if some mouse or other wild creature hasn't peed on them! An old toothbrush is a good tool for scrubbing away the bits of dirt and grass. The nice thing about this village is that nobody sprays their lawns, so I don't have to worry about getting rid of pesticides or herbicides. I drain them on several layers of paper towels over a wire rack, then wipe them dry before cooking them. I separate them by color, i.e., the whiter ones (the ones whose gills haven't turned dark brown yet) in one pile and the the darker ones in another. I usually slice them all. Then I dab them with more paper towels, to get rid of more water. Cooking: I warm some virgin olive oil and fry some sliced garlic until golden brown. I remove the garlic with a slotted spoon, then fry the mushrooms in batches until all the water evaporates and they begin to brown, adding salt, pepper and maybe some thyme. When they're done, I put the garlic back. If I have enough horse mushrooms, I fry them separately because unlike most of the others, they are firm and dry -- very much like cultivated mushrooms -- and they brown more quickly. Otherwise, I fry the white mushrooms first, then I start over with the oil and garlic for the dark ones. The above is only for this type of mushrooms. The shaggy mane is a favorite mushroom among mushroom-lovers. The caps liquefy rapidly, so speed is essential in getting them into the pot. One ardent admirer of this mushroom takes a skillet and butter on collecting trips so that the shaggy manes can be eaten where they are found. Prepare the pie crust. Roll the dough out to a 10-inch crust. Line a 9-inch pie pan with the crust. Crimp the edges. In a sauté pan or skillet, fry the bacon until crisp, then remove it from the pan with a slotted spoon and drain on paper towels. Discard all but 2 tablespoons of the bacon fat and sauté the mushrooms and shallots until the shallots are translucent and most of the mushroom liquid has evaporated. Spread the bacon over the pie crust. Add the grated cheese, then the mushroom and shallots. Mix the nutmeg, salt, and cayenne into the beaten eggs. Add the cream. Slowly pour the custard mixture over the bacon, cheese, and mushrooms. Bake the quiche in a preheated 350º oven for about 35 minutes or until the custard is set and the top is brown. NOTE: Shaggy manes and alcohol make a toxic combination. UPDATE: Since I wrote this post, I have obtained some further information about shaggy manes. Read it here. This article is not intended for use in identifying wild mushrooms. DO NOT EAT any wild mushrooms without consulting an expert. There is a tremendous amount of information about wild mushrooms on the web, including recipes. There might even be a mycological society or association in your area. Better yet, get a guide! Amazon.com is a good place to start.